Why Don't I Have Fruits? OK, How Do I Fix It? WHY DON'T I HAVE ANY FRUITS? Everybody gets frustrated when the fruit trees they spent their hard earned money on and carefully planted in their gardens seem to take forever to bear fruit. That is understandable. It can take years for a fruit tree to become established enough to produce flowers, let alone fruit and it can take even longer for the tree to support a true crop. All our fruits will have bloomed and had a good shot at being pollinated here at the Nursery before they are ever put up for sale. So before you blame yourself or anyone else on your tree's lack of fruit, let's take a look at some reasons that may be behind it all. Size and Age: Peaches and apricots are some of the earliest bearers, and as such, they are among the first to bloom each spring. A standard size peach or apricot can start producing fruit when it is as young as 3 years old. Standard sized apple, pear, cherry, apricot and plum trees take a little longer- around 4 years. Your Semi-Dwarf varieties of fruit trees should start producing earlier, many within the 2nd growing season after planting them out. But remember: all of these numbers are just estimates or averages. Almost all Rabbit Ridge Nursery Fruits are Semi-Dwarf varieties. We seldom bother with Standards (unless we cannot find a cultivar we want on a SD root stock, then we take what we can get) and we only sell Genetic Dwarf varieties as Patio Fruits. There are other factors that affect when your fruit tree starts to bear. Sun Exposure: Almost without exception, your fruit trees need sun. While they may live and even may produce some fruit in part sun, I can assure you they will never be as productive as a fruit tree planted in full sun. Soil Fertility: Fruit trees, like all plants, require some nutrients to survive. But excessively rich soil or heavy fertilization may encourage branch and leaf growth at the expense of fruit production. That being said, there are thousands and thousands of apple trees in the mountains of North Carolina that were planted and abandoned 150 years or so ago- and they still grow apples. Admittedly not very large or pretty apples, but none the less apples. Pruning: All fruit trees benefit from annual pruning, if done in moderation. 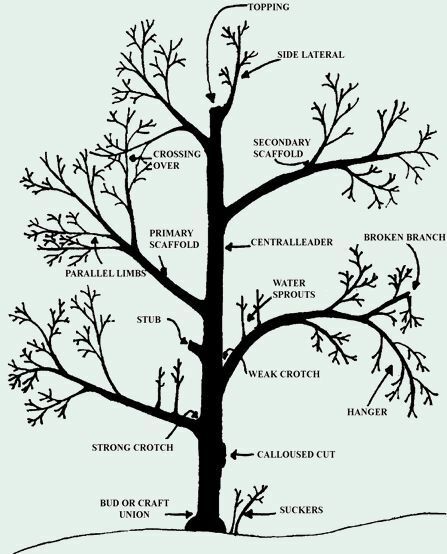 Pruning rejuvenates fruit trees and encourages the growth of fruiting spurs. But removing more than a third of the tree could have just the opposite effect you were going for and stimulate more branches, as the tree repairs itself, and no fruit. Lack of regular, moderate pruning is one of the most common causes of no fruit production. You should plan on pruning out any branches that grow toward the center and prune out any dead or damaged branches. Example of Parts of a Fruit Tree. In addition to pruning, branches may need to be gently forced into a more open canopy to allow for light and air circulation. This can be accomplished by bending them to as close to horizontal as you can get and securing them with soft rope or twine, staking it to the ground. There are also manufactured 'spreaders' that are flexible bars with a 'V' on either end. You can simply position the spreader between two branches to push them apart from each other. Ideally, branches should be in the 10 o'clock and 2 o'clock positions, rather than growing straight up. (If you are cheap like we are, find some of those wooden school rulers and cut a 'V' in each end to use them as a spreader.) And that old adage that a bird should be able to fly through your fruit tree without touching a branch is actually a pretty good saying. Frosts; Damp; Cold Spells: If buds have been forming and not opening, it could simply be the weather that's the culprit. A particularly cold, windy winter can damage susceptible flower buds. Here in Zone 7 in North Carolina, it will more likely be the results of a late spring frost, especially if the buds have already begun to swell. Too Much Fruit Set: I'm kidding, right? Too much fruit doesn't seem like it should be a problem, but there are two drawbacks to over abundance. First, a large fruit set means that the tree's resources are stressed. You usually have to choose between a large harvest of small fruits or a small harvest of good sized fruits. Secondly, some fruit tree varieties deal with the stress of a large crop by taking a rest the year after a heavy harvest. They seem to become biennial in fruiting, producing a large crop one year and little to nothing the next. But don't worry, as you can correct both problems by thinning the crop while the fruits are still tiny (about three weeks after bloom time here in North Carolina). Remove all but one fruit from each of the spurs or small branch offshoots where the fruit is produced. Leave the largest, hardiest looking fruit to survive. Pests; Disease: If it's been at least 4 years and you've provided your fruit tree with good care and growing conditions and still nothing is happening, it would be worth calling us at the Nursery and lets see what is going on. You may have a disease that is simple to take care of or you may be feeding the deer! At Rabbit Ridge Nursery, we know that it's very hard to be patient when you only have one chance a year to set fruit on your trees. But once you get them going, you'll have many, many years of reaping the rewards of a little bit of patience in the beginning. .
After watching your fruit trees flower out spectacularly in the spring and then seeing the tiny fruits beginning to form, it is devastating to see them starting to fall from the tree before they mature. Don't panic, this is normal for fruit trees. It even has a name; June Drop. June drop refers to a fruit trees natural tendency to shed some of their immature fruits. Fruit trees often set more flowers than they need for a full crop, to help them to offset sudden loses from weather or other cultural factors. According to Purdue University Consumer Horticulture, "Only one bloom in 20 is needed for a good crop on a full-blossoming apple tree." As mean as it seems, fruit trees set fruit so that they can produce seed. They simply do not care about producing food for you or anything else. Too large a crop will strain the tree's resources and result in smaller fruits, almost guaranteed to be of lesser quality. So the tree protects itself and its seed by thinning the crop, once it senses weather and growing conditions are stable. The immature fruits are all competing for the same food and water. The strongest survive. Fruits that contain few seeds are the first to drop. Fruit trees may actually start this thinning process earlier in the season by shedding some flowers that weren't pollinated. You might not notice this, because you expect the flowers to drop. But when you see actual fruits starting to fall, it becomes more alarming. Is There Anything You Can Do to Lessen June Drop? Actually there are several things you can do to combat June Drop. You can make sure your fruit trees get plenty of water but at the same time that they're not sitting in wet soil. But for you to try and actually prevent June drop might not help you in the long run. The tree and its fruit will grow best if the immature fruit is slightly thinned. Some fruit trees don't naturally thin themselves enough and need some help from their owners. Fruits that don't have a lot of seeds, like stone fruits (peaches, plums, and nectarines), figs and persimmons usually need hand thinning. Oddly, cherry trees seem to be able to hang onto all their fruit without any problems, except that the birds can clean out a cherry tree in a matter of moments. The bottom line is that June Drop is not just normal; it's actually good for the tree. It's helping you too. You'll not only get larger fruits, but the branches of your fruit trees won't be so heavy they need propping up. By the way, it's called June drop, but it takes place in April or early May here in North Carolina.